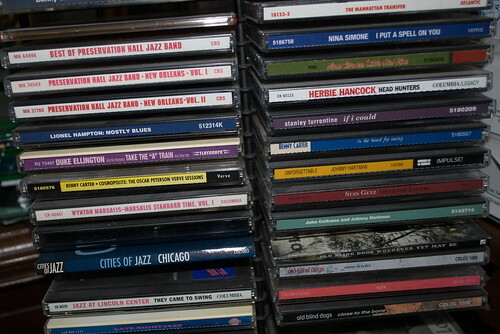 Once I leave the Chicagoland area, I lose my jazz station, WDCB. If I'm heading west, I don't pick jazz up again until I'm across the Mississippi River and can pick up KCCK, the public radio station from Kirkwood Community College in Cedar Rapids and Iowa City. If I fail to pack my CD travel case, as was the situation with the Prairie du Chien trip, I am at the mercy of whatever radio station I happen to stumble upon. When that happens, I gravitate towards "oldies" stations, playing music from the 1960's to the 1980's. I don't really know much pop music after, say 1995. I've always liked jazz but it was Dizzy Gillespie's death in 1993 that made me abandon pop music and jump, happily, into the pool of music that is jazz. Thanks to the need for celebrity, I know 'of' some popular musicians even if I couldn't tell you the name of anything they have done. My travel route to Prairie du Chien took me along Interstate 90. The metropolitan areas passed through were Rockford and Madison. Stations faded and a new one was found. Along the way, I began to hear music that I could have sworn I'd heard on that other station an hour ago. When Billy Joel's "Still Rock and Roll to Me" came on a second time, I knew I had something to chronicle. Let's see what songs or what artists seem to get the most airplay between travels. Although I had time to pack jazz for this last trip to Iowa last weekend, I decided to continue with the experiment since I would be heading north, northeast and back east to come home. It was very, very interesting. On the way out, in addition to "Still Rock and Roll", I heard Hall and Oates' "Out of Touch" and Men at Work's "Down Under" twice each. Queen and the Police were played several times each but not the same song. Played three times between three different stations was "Solid (As a Rock)" by Ashford and Simpson. I think this is a medley of their hit. This really surprised me. As coming back was with Pam, there weren't radio stations to check. The 4th of May found me headed west to Iowa and a circuitous route to drop off a rental car and then do inspections in Iowa and Minnesota. This gave me ample time to check the stations for the same music. Actually, I got kind of tired of hearing the same songs and turned the radio off. The weather was gorgeous so I removed the windows of the Jeep which means listening to any music, even jazz, is problematic. Still there are observations. Hall and Oates and the Police are favorites. Neil Diamond was played, a lot, as was John "Cougar" Mellancamp, but not the same songs. I never heard "Out of Touch" during the May trip. I'm grateful some artists actually have a discography and aren't one hit wonders. Bruce Springsteen's "Born in the USA", Chicago's "Saturday in the Park" and one I never, ever would have expected, a genuine early 1970's rock band, Free, and "All Right Now" were played twice each. That last one is one I never liked when it was popular and I certainly don't like it now. It's interesting that of the thousands and thousands of songs available to a radio station, if they choose to feature songs from the 1960's through the 1980's, maybe dabbling into the 1990's, these artists and songs seemed to get played a lot. There are people and groups in this mix; Hall and Oates, the Police, Billy Joel, Bruce Springsteen; who created and still create a lot of music so it's not surprising you'd hear many of their songs. I noted that I never heard the same Police song played more than once over my travels yet I only heard Billy Joel sing "Still Rock and Roll" and he has, by far, a larger volume of work. He was completely absent from the airwaves during the May trip. Queen, a fan favorite, was heard only once on the Iowa trip and three times with three different songs, through the April trip. There was one song I heard a grand total of 7 times over the course of these two trips. I'm not sure quite what to make of it being the most popular. I heard it 3 times during the Prairie du Chien trip, 3 times during the Iowa/Minnesota trip and once in the car with my niece and her husband and their friend when we were heading home from playing frisbee golf.